00:45:00 Makes 4 servings, 1 stromboli (162 g) each. Makes 4 servings, 1 stromboli (162 g) each. 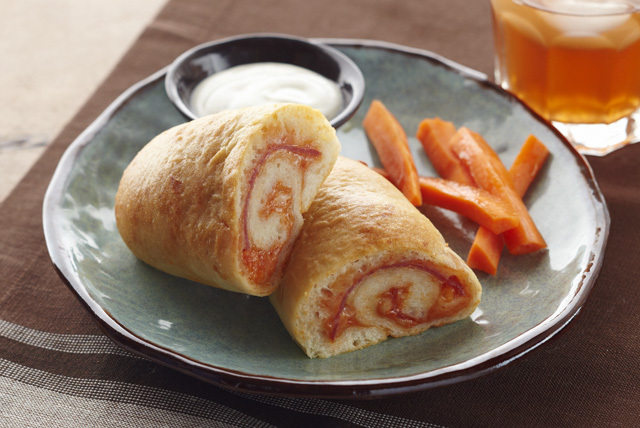 A stromboli is like a rolled up calzone and just as tasty. This 4 Cheese Salami Stromboli has all of your favourite pizza fixings, in one hand-held pizza-inspired sandwich. Divide dough into 4 pieces. Roll out each piece into 7x5-inch rectangle on lightly floured surface. Spread 2 Tbsp. sauce onto each dough rectangle, leaving 1-inch border around all sides. Top evenly with half the cheese, salami and remaining cheese. Roll up each rectangle, starting at one short end. Pinch edges and ends together to completely enclose filling. Place, seam-sides down, on baking sheet covered with parchment or sprayed with cooking spray. Beat egg and water; brush onto dough. For best results, let dough stand at room temperature 1 hour before using as directed. Serve with cut-up fresh vegetables and Kraft Creamy Italian Dressing. Serving Size Makes 4 servings, 1 stromboli (162 g) each.